Though breast augmentation remains one of our most popular plastic surgery procedures, Dr. David L. Durst educates all prospective candidates about the role of breast revision surgery. Breast implants are not designed to last a lifetime, and Dr. Durst teaches his patients how to monitor for ruptures and be vigilant about replacing their implants if needed. Most patients will enjoy excellent results for at least 10 years, and many patients have breast implants that look beautiful after 20 years. There is no specific time limit for any type of implant. However, in the rare event that an implant becomes damaged, promptly addressing this change is essential. For patients who choose saline implants, a rupture to an implant should be immediately obvious as the implant will deflate or ripple. 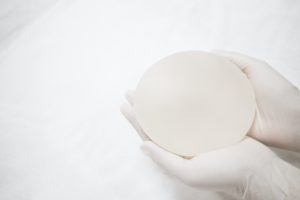 Patients who choose silicone implants may have a more difficult time noticing a rupture since the gel contained within the implant is more form-stable, so changes to size and shape may be slight. Dr. Durst recommends that patients with silicone implants schedule ultrasonic or MRI screenings to check the stability of their implants from time to time. Regardless of implant type, if an implant rupture is detected, breast revision surgery can be used to remove or exchange the damaged implant and restore the shape of the breasts. In addition, many breast implants have a lifetime warranty on the implant itself, in the event that a rupture does occur. Surgical costs will depend on the warranty and other factors, and are the patient’s responsibility. For more information about breast revision surgery, please contact our office today.